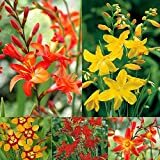 Crocosmia growing herbaceous geophyte of the genus Crocosmia also known as Coppertips or Montbretia, Crocosmia perennial evergreen or deciduous plant, used as ornamental plant and can be cut flower, can grow in subtropical, temperate or mediterranean climate and growing in hardiness zone 6-10a. 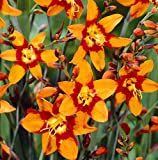 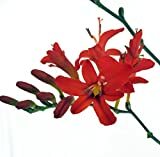 Flower color red, orange, yellow in tubular round shape with 6 petals, flowers grow on stems and mostly open one after the other that the one in the top open last. 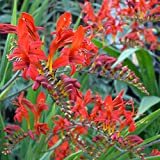 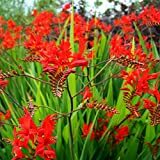 Crocosmia Mix (25 Bulbs),bright red color,drought-tolerant,zones 6 through 10.